You might ask, “running ads on either one…what’s the difference?” It’s a BIG difference. We always ask our clients, “Do you want customers now or customers later?” Ususally that pertains to whether we start an ad campaign for them vs building out a website and SEO, which takes more time. However, in advertising, it breaks down even further. 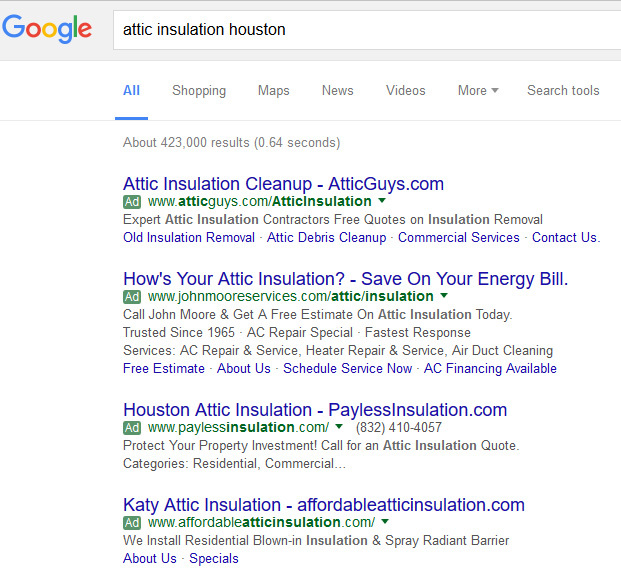 Basically the rule of thumb is if you need customers now, run Google Ads. If you are not in a hurry and have a product or service you want to make the workd aware of, then Facebook Ads might be the better choice for you. Look at Google ads from a customers point of view as “I need help right now!” Example: a pipe bursts in the house and water is going everywhere. Are you going to go on Facebook and see if an ad crosses your newsfeed while your house fills with water? OR, are you getting on Google searching 24 hour emergency plumber and getting someone oever there ASAP to fix the broken pipe? So, Google Ads are for “Right Now Customers”, whereas Facebook Advertising is more for the “I want…” customers. Google Adwords gives you the ability to rise above your competition by paying Google for certain keywords and desiging an ad that will be seen first when someone does a search on google for a specific topic. Google is without a doubt king of the web. In just a little over a decade Google has managed to dominate the web with its succinct search results. These ads appear in order of who is bidding the most for a set of keywords. Effective but it can get expensive. 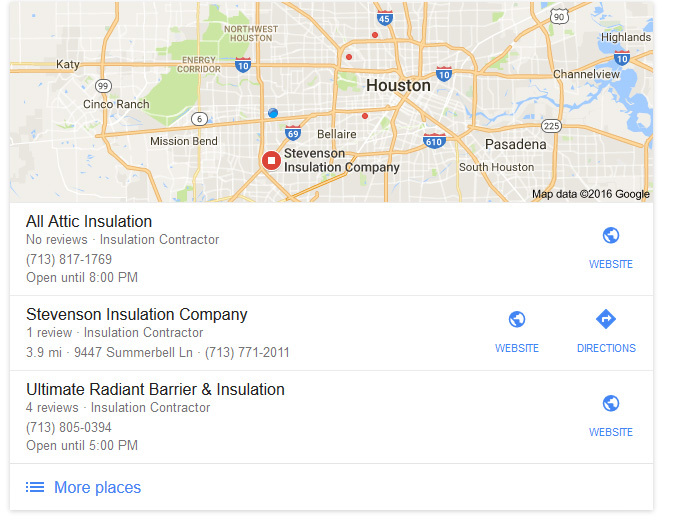 By clicking on the “More places” link on the bottom of this map link section it will open up a map showing a listing of businesses listed on Google’s Business pages. King Consulting Group works with your company to see that all criteria are met to get you listed in the map pack as well as organically. As you can see from the above examples, some companies are listed in both, or in some cases all three if they are paying for Google Ad placement. The issue with this is Google Ads can get expensive fast! 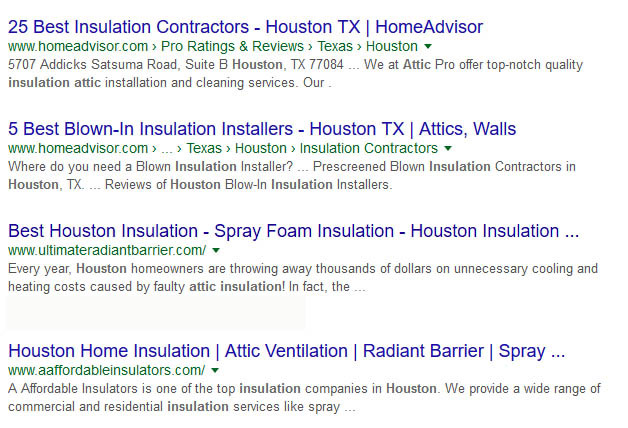 Certain keywords are bidding at a very high cost per click example : “insulation” could be $15.05 PER CLICK, whereas something less competitive like “houston insulation company” could be bidding at $1.05 per click. Each time that phrase appears in a google search and a client clicks on it, it costs you whatever you bid for that keyword. So you can see, it can get pricey fast! It is effective marketing and because a good majority of the world uses Google (minus the guys wearing aluminum cone hats…) to do their searches and your ad will be seen. This in turn could convert into calls and from calls to sales. So this is one option for internet marketing websites. Our preferred method is Facebook and I will explain why thoroughly here. First of all, over 90 MILLION people are on Facebook daily. Whether on their desktops or tablets or in most cases, their phones. That’s a lot of potential customers. We like using Facebook marketing to send “Clicks to Website”, meaning your FB ad when clicked brings your potential client directly to a landing page where you can convince them to pick up the phone and call or get a quote from you online. Easy. The main thing we like about Facebook ads is the amount of control you have over your campaign. We didn’t go in to this earlier with Google, because we wanted to make sure you had a comparison and info first. Facebook allows you to set a budget in a dollar amount and the campaign will run until that amount is depleted. Google Adwords, however, kind of does this, but you have to monitor your account and then stop the ad once your funds reach their limit. We don’t think this is very efficient. No one has time to run theri business and also babysit Google Ads to make sure you don’t get slapped with a $1000 invoice for an ad campaign! 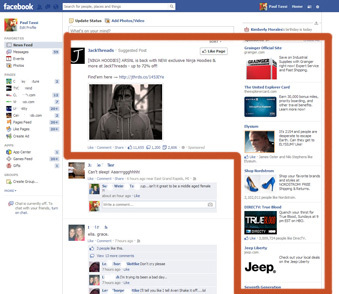 With Facebook Ads, you set the dollar amount, set the time you want the ads to run (i.e. number of days or weeks) as well as times of the day to run the ad. When the funds are depleted, the ad stops running and you get a report for the results. In addition, Facebook Ads allows you to choose from thousands of audience demographics (i.e. age, gender, income, education level, marital status, area of town or city, online spending habits…blah blah blah) So you can hit a very specific audience instead of a broad audience which increases your chance of making a sale. The other really cool thing about using Facebook Ads is that you can swipe your competitors audience if they have a Facebook page. Under the demographic search you type in your competitor and add those who like their page to receive your ad on their page. Facebook Ads can be optimized to be seen on both mobile and desktop platforms. Win win for you! In addition, you can also have them appear in Instagram if you choose to do so, although we haven’t seen much use for that in marketing results. With that having been said, Facebook Ads are not for every company. People don’t search Facebook looking for plumbing services, so the better option would be Google as most people will go to their computer or phone to look up a plumber and see who’s out there. We are here for you to help get your business back on track. We invite you to give us a call and get a free consultation to see what we can offer to you. Just click the button to the right to call now.